Cardiovascular magnetic resonance (CMR) is widely used for vessel wall imaging, particularly in the carotid artery. The arterial wall can be imaged at high resolution, and this methodology has been widely used, for example in studies of atherosclerotic plaque characterization and of plaque response to statin therapy. However, the major limitation is scan time, which can be over one hour, limiting applicability in large studies, and acceptability to patients. The conventional sequence is a 2D fast spin echo (FSE) sequence. Each slice may take 1–2 minutes to acquire (depending on resolution), and numerous slices are required. A 3D multi-slab volume selective FSE sequence developed at our institution is faster. It has been validated in several technical studies, but not in a larger study of clinical performance. The purpose of this study was to compare a multi-slab 3D volume selective FSE MR sequence with a routine 2D FSE sequence for quantification of carotid wall volume. One hundred normal subjects (50 male, mean age 44.6 years) had carotid arterial wall MR using 2D and 3D techniques. A 1.5 T scanner (Siemens Sonata, Erlangen, Germany) and a purpose-built bilateral four channel phased-array carotid surface coil (Machnet BV, Eelde, the Netherlands) were used. The resolution of both sequences was identical (pixel size 0.43 mm × 0.43 mm, interpolated to 0.21 mm × 0.21 mm during reconstruction). Planimetry of the carotid artery was performed to measure total vessel volume, lumen volume and wall volume over 20 contiguous slices. 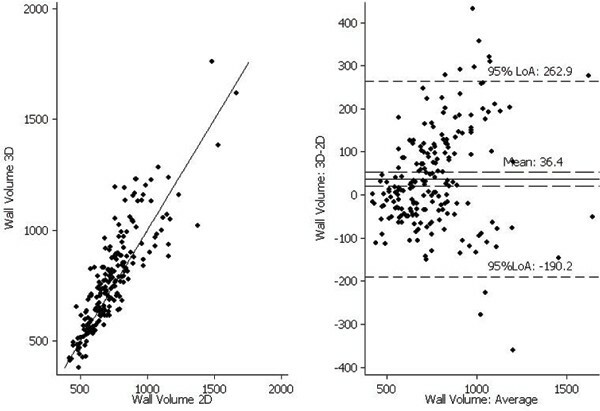 Wall volume was expressed as a percentage of total vessel volume (wall/outer wall (W/OW) ratio). The 2D results were compared with 3D using scatterplots with line of identity, Bland-Altman plots and lines of best fit (Figure 1). Institutional review board permission was obtained, and all subjects provided written informed consent. In 100 volunteers, a multi-slab 3D magnetic resonance technique for measuring carotid artery wall volume performed as well as a standard 2D technique, with a reduction in scan time of up to 63%. 100% of datasets by both techniques were suitable for analysis. The Bland Altman plots showed the mean difference between 2D and 3D datasets expressed as a percentage of the mean absolute value was 1.7% for vessel volume, 4.9% for lumen volume, 4.7% for wall volume and 5.8% for W/OW ratio. There was good correlation between 2D and 3D models for total vessel volume (R2 = 0.91, p < 0.001), lumen area (R2 = 0.91, p < 0.001), and wall volume (R2 = 0.74, p < 0.001). The correlation for the W/OW ratio was weaker (R2 = 0.26; p < 0.001). The scan time needed to acquire 20 slices by the 2D technique was 1360 RR intervals. By comparison, the scan time to acquire 24 slices in 3 slabs by the 3D technique was 609 RR intervals. This is a 55% reduction in scan time. If 24 slices were to be acquired by both techniques, there would have been a 63% reduction in scan time with the 3D technique. Multi-slab volume selective 3D FSE carotid arterial wall imaging performs similarly to a conventional 2D technique, but with substantially reduced scan time. The values for total vessel volume are very similar. The 3D technique yields values for lumen volume which are 4.9% less, and wall volume which are 4.7% greater than those from the 2D technique. These discrepancies may result from greater blood flow artifact in 3D images being contoured as vessel wall. The resolution of both techniques is identical, so the difference cannot be attributed to different degrees of partial volume averaging. The comparison between the techniques is less good for the variable W/OW ratio, which is derived by dividing wall volume by total volume, thereby magnifying measurement error. This suggests that the carotid wall volume is a more reliable parameter of atherosclerosis burden when comparing across MR techniques. Overall, the reduction in scan time with the 3D technique significantly improves clinical performance of FSE carotid imaging.